How many fairy tales can you think of with a Big Bad Wolf? 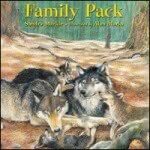 Can you retell one of those fairy tales and turn the Big Bad Wolf into the Great Nice Wolf? Have the wolf be kind and do nice things to others instead of being big and bad!